What do you get when you put the most stooge like family in cinema in a place filled with pitfalls. Los Vegas is made of such hazards and the Griswolds are at it again in there most latest outing. The great thing about these films is the objectivity you attain after seeing the dynamics of this family. We have seen the Griswolds run riot in Europe, Wally world, and at home for Christmas. Clark (Chevy Chase) always has the best intentions and it always ends up in disaster. The family gets separated, Clarke is always getting into trouble with whatever possible and the kids are equally doing their part to accentuate the predicament. This time in Los Vegas, the holiday destination of choice by Clarke after a healthy bonus from his successful preservative tailoring business. The family aren�t at first enthusiastic but warm to the idea as time goes on. When they get there the wheels of disaster are slowly set in motion. Helen (Beverly D�angelo) sees her idol Wayne Newton, Clarke gambles incessantly, the kids run riot and there seems to be no end to this rollercoaster of ambivalent emotion. The Griswolds seem to bottom out until Cousin Eddie (Randy Quaid) enters the scene to make matters worse for our beloved family. After a visit to the �dam� dam near Los Vegas which showed some funny yet corny gags. For instance Clark ends up getting separated from the tour group, that the family joined up with, and Clarke gets lost and ends up trying to shimmy across an electrical cable, suspended a mile high above the dam. His buoyancy and don�t worry about me� attitude makes the whole experience that much more enjoyable. The humour throughout is a little on the corny side, well maybe a bit more than a little but its undeniable charm will captivate the audience. Chevy Chase seems older in this picture, the kids are different as usual but Rusty and Audrey hold their own well. The scenes with the cousins are great, although corny once again. This family has some pretty kooky, yet amusing behaviour. Try having rattlesnakes dropped on the ground to keep the 10 kids entertained while Kath and Eddie go to town. The great thing about the Vacation series is that the worse the situations seem to get the funnier it is. Clark losing thousands of dollars the kids getting into inappropriate undertakings. Helen being swooned by a famous entertainer Wayne Newton. The only part, which I had a problem with was the part where Helen and Clark Griswold decide to get married right at the very end. Corny stuff. It�s unfortunate they had to include this embarrassingly cheesy addition. The sound is excellent in Dolby Surround. There are plenty of extras to elaborate the cast History. Chevy Chase having some very interesting information about his journey into the world of film. There is very little information on Marisol Nichols who played as Audrey unfortunately because her performance was noteworthy also. 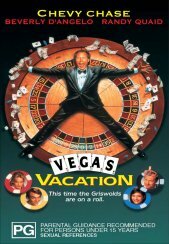 There is a wealth of features on this film but it is all static text except for the Vegas Vacation Trailer. Overall though if you are a fan of the Vacation movies, which I know I am, then this film is recommended. The mayhem that the Griswolds get up to is always a bit of fun. Except the corny stuff of course. If you are wondering whether this instalment is better than the rest I would have to say a firm no.